Even before the opening remarks at our November 19th Sustainable Investing session, we had already accomplished several of our goals. Interest in the topic was high, as we believed it would be. We had a full house at the Metro Meeting Center in Boston, surpassing our original estimates. In fact, we had to turn away a few prospective attendees in the last few days before the event. Equally important was the breadth of organizations and investors represented by the attendees. The audience included investment professionals from firms serving individuals, family offices, endowments, foundations, pension funds and large institutional investors. Participants worked with a range of asset classes – public and private equities, fixed income and alternative investments. Most importantly to us as organizers, the mainstream investment community was well represented. Having brought that diverse audience together, I wanted to make clear in my welcoming remarks that they should feel very comfortable at a seminar on sustainable investing. Why? Because the underlying principles of sustainable investing should look very familiar to investment management professionals. Sustainability is the challenge of advancing global economic development and increasing standards of living worldwide in ways that do not compromise the ability of future generations to pursue those same goals. While individual investors’ time horizon may only extend to the one or two generations they can see, they too certainly struggle – and cause their investment advisors to struggle – with the questions of today versus 20, 30 or 50 years from now. These factors – environmental, social and governance – are at the heart of sustainable investing. 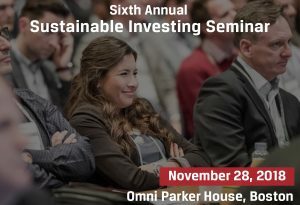 Selecting the factors that are important, understanding and assessing when they are material, and analyzing how they affect a business, industry or sector, are the challenges of sustainable investing. 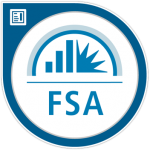 While the data and tools available to analyze these factors are not yet at the level of those we use to analyze financial statements, they are making rapid progress. Sustainable investing incorporates environmental, social and governance considerations into investment decisions to achieve competitive long-term financial returns and positive societal impact. It informs and integrates with existing investment practice. In future posts, I plan to highlight some of the ideas from individual sessions in more depth.